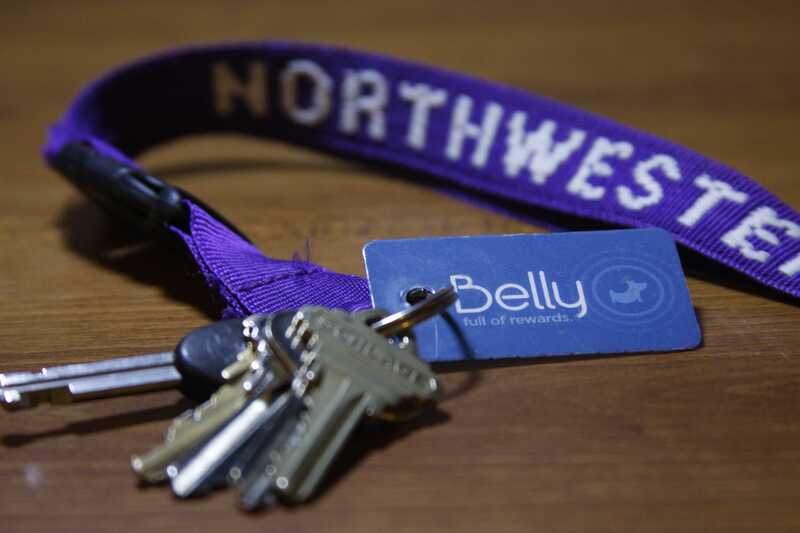 A loyalty card from Belly, a Chicago-based start-up, is pictured with a set of keys. The Bellycard rewards program offers points for purchases made on campus and in Evanston. Northwestern students, faculty and staff can now earn rewards for dining on campus through a newly-implemented loyalty program. Belly, a Chicago-based startup used in businesses nationwide, uses a scanning system to award points that can be redeemed for free meals, food or even a full catered lunch in all six dining halls and some retail locations on campus. NU food service provider Sodexo piloted the program in Norris University Center over the summer and installed the iPad-based system in all the dining halls for the beginning of Fall Quarter. Belly users create an account by downloading the program’s smartphone application or registering a swipe card with a detachable keychain card, available in dining halls and NU retail locations. When entering a participating location, whether its Allison Dining Hall or Flat Top Grill in Evanston, users swipe their card, keychain card or scan their smartphone at the business’ iPad. Each visit earns a specific number of points redeemable for various rewards at that location. Every dining hall visit or retail purchase is worth five points, which, unlike Munch Money or meal plan points, do not expire at the end of the quarter. The potential rewards can be viewed in-store or online: 50 points in Norris is equivalent to a free coffee or soda, 35 points in a dining hall earns a free meal voucher and 600 points in Norris can be redeemed for a free lunch for the Belly user and three guests. “It drives business and cross-promoting within locations,” Gargiulo said. All Belly rewards at NU are food-based, but some Belly businesses have created other incentives for frequent customers. At AlleyCat Comics in Chicago, 250 points earns the right to punch a staff member of choice in the stomach. Flat Top’s rewards range from a 10-point free soda to posting a favorite recipe on the location’s chalkboard. Other Evanston businesses also use the Belly loyalty system, including the nail salon Nail Bar Evanston on Chicago Avenue and hot dog joint Wiener and Still Champions on Dempster Street. Nail Bar Evanston manager Ioana Vincce said in the four months since the system was implemented, between 70 and 80 percent of her clients have signed up for Belly. “They love it, and they’re still excited,” she said. At the salon, Belly users can redeem five points for a reduced-price manicure-pedicure, while 175 points earns the same service for free. Because the system is new, Gargiulo said he does not yet have data on how many Sodexo patrons have used the service, but he said clients have embraced the rewards program. Bienen senior David Young said he picked up a Belly card at work in June, but has not used the program since then. “It might be convenient for smartphone owners, but I don’t want to carry another thing on my keys,” Young said.